Cholinergic urticaria appears rather rapidly, usually within a few minutes after the onset of sweating, and lasts from a half hour to an hour or more, with a mean duration of about 80 minutes. Cholinergic urticaria symptoms are sufficiently uncomfortable to cause many patients to change their patterns of activity to prevent attacks. Exercise is the most common precipitating event for cholinergic urticaria, but any stimulus that causes sweating, including elevated environmental temperature, hot food, sauna baths, immersion in hot water, gustatory stimuli, emotional stress, and hemodialysis,  can bring on an urticarial attack in some persons. Exercise and hot baths exacerbate pruritus and provoke lesions in previously unaffected areas. Cholinergic urticaria may appear anywhere on the body, except on the palms or the soles and rarely in the axillae. Sometimes, flares are the only presentation. Persons with cardiorespiratory symptoms include patients with increased pulmonary resistance with acetylcholine challenge, which may be a limiting factor in certain occupations (eg, those relating to aerospace). One form of cholinergic urticaria, sometimes called cholinergic erythema, is believed to show persistent and individual macules of short duration, but with new macules continually appearing at adjacent sites. In one series of 22 persons, the average duration of cholinergic urticaria was 7.5 years, with a range of 3-16 years. In 7 patients on follow-up study, however, some retained the cholinergic urticaria tendency for 30 years. The most reliable way to reproduce cholinergic urticaria is to cause the patient to sweat from a stimulus, such as during exercise (eg, walking or running on a treadmill). Cholinergic dermographism occurs in the form of localized distribution of typical tiny wheals that appear after stroking the skin of some patients with cholinergic urticaria. A localized form of cholinergic urticaria with a presentation with cold-induced urticarial lesions may occur. Patients with this condition were found to experience a generalized reaction to cold ambient air and cold water, but a negative response to the ice-cube test. 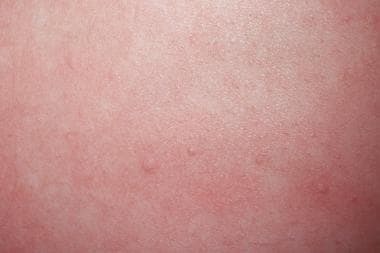 Cold urticaria and cold-induced cholinergic urticaria may be seen in about 1% of patients with cold urticaria.